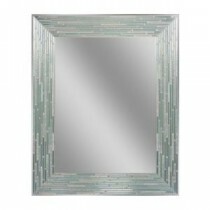 This frameless aqua/blue mosaic tile composition resembles aged sea glass. Each tile is screen printed with transparent AQUA's, blues and clears from the back and then mirrored with silver to give it a vibrant, reflective look. A surface water clear viscous ink enhances an impressive texture relief which just begs to be touched. Simulated elongated tile designs complement many of the newer tiles sizes in today’s home.